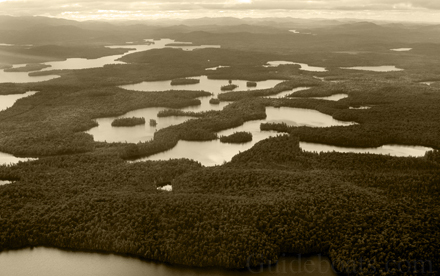 The Adirondacks are an island of wilderness surrounded by water. The Mohawk River to the south, Lake Ontario to the west, Lake Champlain, Lake George and the Hudson River boundary is to the east, and the mighty St. Lawrence River is the northern boundary. Within these boundaries are thousands of interconnected lakes, ponds, river, streams and wetlands. The Adirondack dome has been referred to as a high altitude swamp. When the first white settlers came to the Adirondacks around the 1820’s, they found that the easiest way to get around was by water. Rather than trying to bust their way through the Spruce-Fir swamps and old growth thickets, it was a lot easier to travel the natural highway of water that bisects the Adirondacks from the St. Lawrence River to the north to the Mohawk River in the south. However they soon found that the boats they had at that time were too heavy and cumbersome for the rigors of the region. The Adirondack waters are all interconnected lakes, ponds and rivers that frequently require carrying the boats and gear over eskers to a pond to another pond to a stream, around rapids, over beaver dams, to a lake where one could go for several miles until you had to unload all your gear to carry it again. The furthest you can travel by water in an unbroken stretch in the Adirondacks is down Long Lake, about 15 miles before you need to carry around Raquette Falls. The average is more likely to be 4-5 miles however. From Old Forge to Saranac Lake is close to 100 miles by water with 10 carries of about 8 miles total. While you can get around easier on these wet highways than overland, you are constantly getting in and out of your boat. From river to lake, pond to pond, around rapids and waterfalls, and over beaver dams and carries, you continually had to pick up and carry your boat. They soon recognized that the boats they were accustomed to were too heavy and cumbersome to be practical. 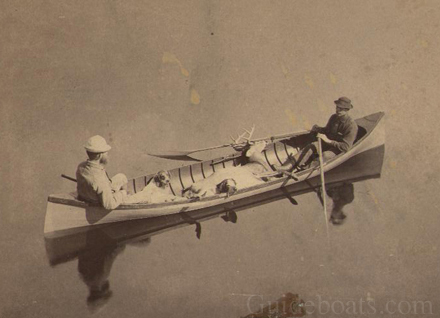 So using the boatbuilding techniques of the era and the materials at hand they soon evolved a boat that filled all their requirements and more, fashioning small, lightweight, boats that could carry two men and their gear while being easily carried over and around obstacles and between bodies of water. The two main woods that make up these boats are Red spruce (Picea rubans) and Eastern White Pine (Pinus strobus). Observing closely the natural bend of the spruce roots, early builders saw that the crook was a perfect match of the turn at the bilges in a boat. Digging up the stumps of spruce trees they fashioned the ribs or framework of the boats, by sawing them out of the root crooks following closely the turn of the grain so the ribs didn’t require steam bending. Using the native White Pine, which grows very straight and large with clear (no knots), even-grained wood that was easily shaped and worked by hand, they fashioned the planking for these boats. By overlapping each plank by about ¼”, they were able to make a watertight fit. These were age old-boat building techniques which the Vikings had begun using circa 500 A.D. These first boats appeared around the 1830-40’s. While they might seem a little crude compared to later boats, they nonetheless were a revolution in their time. Very quickly they evolved into the ultimate mode of transportation. Between 1840-1860 these boats went through several changes. The first change was from proud laps to smooth laps. By making the ribs and planking thinner and by beveling both planks at the seam so as to have a smooth-skinned boat, these woodsmen were able to shave as much weight off of these boats as was practically possible. These boats, born of necessity, fashioned in the forest with nothing more than hand tools, from the forest’s natural bounty, capable of carrying loads up to a thousand pounds, came in weighing around eighty pounds. It wasn’t until 150 years later that boats capable of doing that were built using the latest high tech materials. Another change was from having a small ‘wine glass’ transom at the stern, to making both ends with natural crook stem pieces. This made the boat a “double-ender” much like the fishing wherries and dories of the costal regions. This change also gives these boats the appearance of a Native American canoe, which confounds most people into believing them to be related. However, they are not related at all. 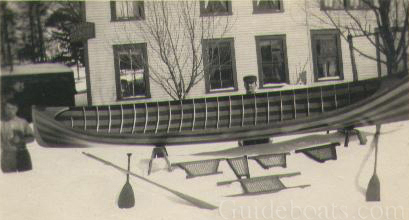 The Adirondack skiff is of European heritage, most likely been patterned after the captain gigs of the naval ships. They are a rowing skiff, propelled by two oars manned by one rower, rather than by a short shafted paddle. The rower faces the stern of the boat and pulls on a pair of 8’ oars that are secured to the boat with an interlocking mechanical pin and bearing called oarlocks. Some people have complained about having to go backwards, however this is not true. The boat is being propelled forward; the rower just is not facing the direction of travel. And I like to see where I’ve been. 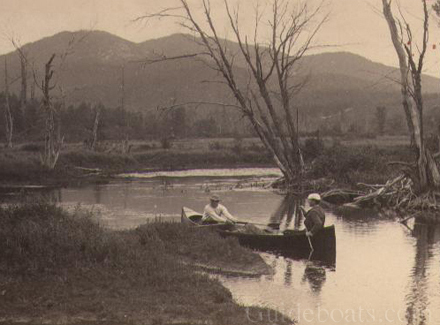 These little rowing skiffs became the primary form of transportation throughout the Adirondack region. They were the ‘pick-ups’ of the Adirondacks. Not only were they used for hunting and fishing but they literally moved goods and peoples from one place to another. Through the 1860-80’s more and more of these wealthy industrialists, railroad tycoons and robber barons came up to the Adirondacks. They began to buy large tracts of land for their private holdings. They often would build huge sprawling estates with dozens of separate buildings for different functions. These “camps” have become what is today known as the Great Camps. Each family would try to outdo each other in rustic splendor and opulence in the wilderness. Among the buildings of course would be a boat house, which would be filled with guides and their guideboats. 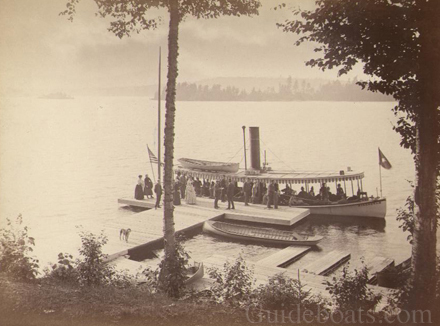 It was during this era, the gilded age, that the Adirondack guideboat was refined into the sleek and beautifully finished craft that it is today. The ribs were narrowed and the planking was shaved down to 3/16 - 1/4” thick. The small decks at each end became more decorous and the seats and gunwales were made using Black Cherry. More and more of these boats were highly varnished, becoming more like high art than a working mans tool. The original working boats of the hunter and woodsmen remained painted, usually a combination of green and blue. This color scheme blended into the forests and waters as a means of camouflage. The paint, being highly pigmented, also gave better protection to the boat from the harsh elements. When the boats became varnished, they were kept in boathouses, which protected them from damage. At this time these varnished boats became a recreational item rather than a working craft, meant to be looked at as well as rowed. 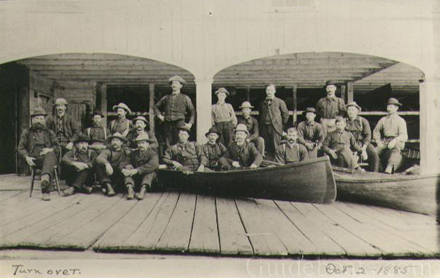 During this gilded age of the Adirondacks from 1865 - 1930, the demand for guideboats gave rise to dozens of builders and shops. There are three distinct regions in the Adirondacks as it pertains to guideboats, and each region has its distinct pattern of guideboats. These regions are the Old Forge/Boonville area of the southern Adirondacks; the Long Lake/Raquette Lake/Blue Mt. Lake region of the central Adirondacks. and the northern region of Tupper Lake/Saranac Lake/St.Regis-Paul Smith’s area. Up through the 1920’s the demand for guideboats was strong with several shops going strong, building several boats a year. 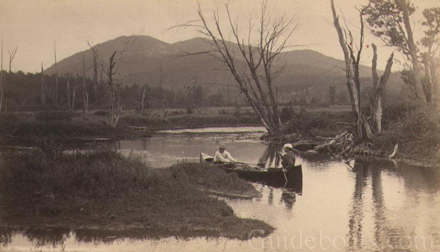 However events conspired to bring about a downturn in the boat industry in the Adirondacks. 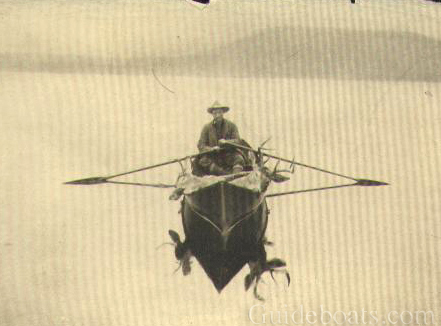 First was the growing popularity of the “Indian canoe.” The canoe, being less of a high performance craft, was much more forgiving for the average tourist to use and abuse. The second was the development and advancement of the bicycle and automobile. These competed with the public’s affection for boating as recreational and leisure pursuits. Then finally came the stock market crash of 1929, which effectively wiped out most of the tourism industry in the Adirondacks. These were the main factors leading to the downturn of Guideboat building in the region. After World War II, the advancements in outboard motors, fiberglass and aluminum fabrication, and plywood construction played a part in the decline of wooden boat manufacturing nationwide. From the 1930’s onward there were only two or three Guideboat builders working, with the majority of the work being repairs. Of these builders, the best known were Theodore Hanmer and his son Willard, of Saranac Lake. Willard operated his shop until his death in 1962. Carl Hathaway bought the shop in 1963 and operated it through 1990. 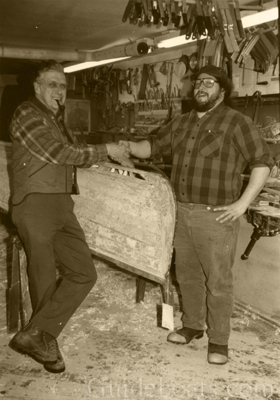 He and Ralph Morrow were the last two builders of the time until NCCC hired them to teach a boat building course in 1980. 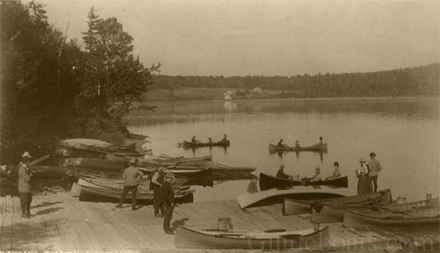 Since that time there have been several local individuals who have built boats or worked restoring the old ones. In 1991 Christopher Woodward, who worked with Carl at his shop, bought the shop and has operated it since under the name Woodward Boat Shop.